This year we celebrate the discovery of 51 Pegasi b in October, 1995. 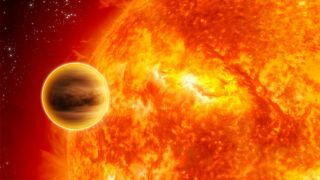 This giant planet is about half the size of Jupiter and orbits its star in about four days. '51 Peg' helped launch a whole new field of exploration. Astronomers have developed some clever methods of detecting tiny planets orbiting distant stars. See how scientists find alien planets in our full infographic here. The huge leap exoplanet scientists — and many scientists of all stripes — are hoping for, of course, is the discovery of life beyond Earth. Queloz thinks it's going to happen.